Smokey & The Bandit is a classic movie that helped make Jerry Reed's "East Bound & Down" become a classic American anthem. 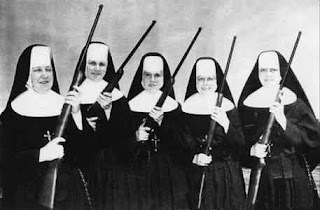 The sequel tried hard to duplicate the original's success but it just couldn't hold up. One of the weirdest parts of the film has the Bandit hawking a new single he's recorded entitled, "Let's Do Something Cheap & Superficial". You never get to hear it in the movie but it did make the soundtrack as well as a release on a single of it's own. 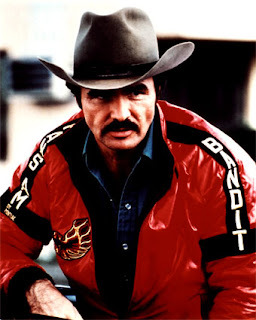 Here it is in all of it's Burt Reynolds glory. Enjoy! Here's a brand new series of posts that I decided to start. It features films from my collection of Super 8 and 8 Millimeter movie collection. These films were all wonderfully digitized by my good friend, Mark "Dangerboy" Nelson. He did such an amazing job. The first post is a Three Stooges short entitled, "Hold That Lion". The film is old and a little rough but is great viewing none the less. Mark also added the music and "sound effects" which I'm sure you will find as a stroke of pure genius! Enjoy! Here's a video from The Great Giorgio and his band, The Electric Love Cannolies. For those of you who don't know who Giorgio is, this is a must see. He's a one man army of music and hilarity! In 2004, he headlined the Block Island Music Festival in Rhode Island and even had his own syndicated television special entitled "The Giorgio Variety Special". This is taken from that show. Enjoy! for more Giorgio, visit www.myspace.com/thegreatgiorgio! Well, I'm home from the Pippin tour! It was a blast and I had such a great time! 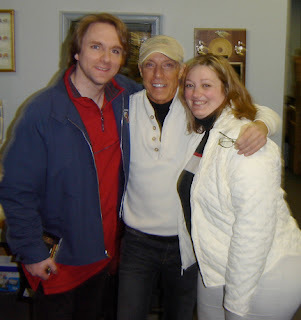 One of the highlights of the tour happened on the very last day - I met Jerry Blavat! The Geater With The Heater! He signed a CD for me and took a picture with me and my wife and talked a blue streak! It made me dig out my Jerry Blavat records out when I got home today and I hope to have then posted soon. For now, here's the super groovy picture! 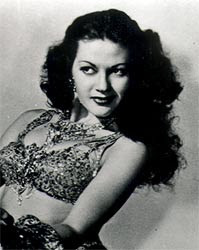 I'm sure that you've all heard that Yvonne DeCarlo passed away on January 8. While she was best remembered as Lillian Munster, she had a tremendous film career that started in 1941 and continued right through to the 90s. Ernie Not Bert has posted her album of standards from 1957. Head over there and check it out! Today's my sister's birthday. Usually I don't agree with her taste in music but there are a few exceptions. One of them is The Partridge Family. I found this clip on youtube so I thought I'd post it in honor of her big day. Enjoy! 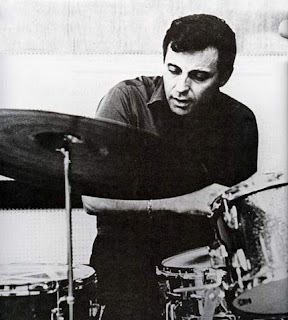 Hal Blaine is one of the most recorded drummer in the history of recorded music. He's played on more hit records than any drummer in the rock era, including 40 #1 singles and 150 that made the Top Ten. He was the most in-demand session drummer in Los Angeles during the Sixties and early Seventies, and a list of musicians he played with reads like a who's who of popular music. He served as the percussive backbone of the "Wrecking Crew"—the nickname that younger studio hands on the L.A. scene bestowed on themselves after the rock-hating old-timers complained they were "wrecking the business." He was a key component of Phil Spector's "Wall of Sound" production, which yielded such classic rock and roll hits as "Be My Baby," by the Ronettes, and "Da Doo Ron Ron," by the Crystals. In addition to all of these great albums, he also recorded a slew of his own. In August 1965, he released his first LP; Drums! Drums! a Go-Go which consisted of standards such as "La Bamba", "Rumble" and "Land of A Thousand Dances". In 1967 he followed it up with Psychedelic Percussion. Blaine brought in the best he could find in the field of electronic music and percussion who in turn brought in an exotic mix of keyboards and percussive instruments. It also had a concept in that each track represented a different month of the calendar. Here, in the first month of the year, I bring you Hal Blaine's "Psychedelic Percussion". Enjoy! Here's another muppets clip for you featuring Rita Moreno and Animal performing "FEVER"! This is hilarious! Enjoy! This clip of Dizzy Gillespie on The Muppet Show from 1980 is truly cool! Here is my first post and sharity of 2007! My first sharity of last year was a single from the band, The Monks, entitled "Nice Legs, Shame About The Face" which you can read about here. I thought it would be only fitting that one year later I follow it up with the complete album from which that single came. This album is a spoof of punk rock led by the former rhythm section of The Strawbs. It was released in 1979. I found this album in Toronto just a few months ago when I was there with the Pippin Tour. Now I'm in Costa Mesa, CA with the tour and am sharing this great find with you! Enjoy!